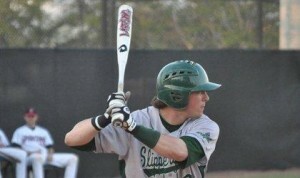 SLIPPERY ROCK – Senior shortstop Adam Jury of Bigler was recognized for one of the best weekends of his Slippery Rock career by being named Pennsylvania State Athletic Conference West Division Player of the Week. The Clearfield Area High School graduate belted seven hits, three of them home runs, and drove in 10 runs as The Rock took three of four games against Indiana to maintain its grip on first place in the division at 11-5, a half-game in front of Mercyhurst. Jury, who also doubled and was 7-for-16, had a slugging average of 1.063 and an on-base percentage of .500 for an OPS of 1.563. He paced The Rock to a 9-5 win in Friday’s nightcap at Indiana by pounding a double and two home runs, including a two-out, three-run blast that snapped a 5-5 tie in the sixth inning. His solo homer in the third had tied the score at 3-3. He also started three double plays, the final one ending the game as he gobbled up a grounder, stepped on second and fired to first. Back home in Jack Critchfield Park on Sunday, Jury singled twice in the 9-5 Game 1 loss and then delivered a three-run homer in the third inning and an RBI-single in the seventh that tied Game 2 in the bottom of the seventh. Jury advanced to third on two wild pitches and scored on Matt Accardi’s hit to give The Rock a 12-11 victory. In his last six games, Jury has boosted his average from .252 to .296, fourth highest on the team. He is tied with Kutztown’s Shane Houck for the PSAC lead in RBIs with 36 and is tied for fifth in home runs with five. His 37 hits and .494 slugging average are second for The Rock, which is 11-5 in the PSAC and 22-12 overall. Jury also has participated in a team-high 19 double plays. ERIE – Freshman Chad Zurat of Clearfield picked up his second save while sophomore Mike Moyer of Clearfield suffered his first loss for Penn State Behrend (17-7) last week. Zurat preserved a 1-0 win for Andy Kountz against Allegheny Thursday by fanning two Gators after entering the non-conference game with a runner at second base and one out. The right-hander made his sixth appearance of the season Sunday in a 6-4 loss to Pitt-Greensburg at Pullman Park in Butler, relieving Moyer in the bottom of the fifth inning. He gave up a double and then issued an intentional walk, his first free pass, before striking out two Bobcats. Zurat registered two more strikeouts in the sixth, giving him 13 in 7.1 innings this season. He’s allowed just three hits and one run, unearned. He’s tied for fifth in the AMCC in games finished with five. In his first defeat after three wins, Moyer surrendered a season-high eight hits, including the first home run, and six runs, five earned, in 4-1/3 innings. He struck out five and walked two. Opponents still are batting only .185 off of him, and that’s tops in the AMCC. He’s tied for third in earned run average (2.15) and hits allowed (25), tied for fourth in earned runs allowed (9), fifth in total runs allowed (12), sixth in innings pitched (37.1), tied for seventh in walks allowed (9) and eighth in strikeouts (28). Senior first baseman Kyle Kline of Clearfield walked to force in a run for the Lions in their 14-5 opening win over Pitt-Greensburg. He also played against Allegheny and 12-2 and 20-6 wins over D’Youville (N.Y.) on Friday. Kline is hitting .167 with five RBIs. Penn State Behrend, 4-2 for the week with the other loss to Allegheny 14-8, holds down second place in the AMCC at 9-3. LaRoche (9-1) is the front-runner. BRADFORD – Sophomore center fielder/pitcher Ben McGary of Curwensville had two hits and two runs batted in for Pitt-Bradford (16-11) in four Allegheny Mountain Collegiate Conference games last week. He single in one run and was hit by a pitch for another RBI in the Panthers’ 14-2 romp over host Hilbert at Hamburg, N.Y., Thursday. The Panthers were shut out 6-0 in the second game and then also split with Penn State-Altoona on their home field Friday. They were blanked again 11-0 on three hits, one by McGary, before outlasting the visiting Lions 14-11 to balance their AMCC record at 6-6, good for fifth place. McGary’s average dipped seven points to .238. He has 15 hits and 12 RBIs. Though not called on to pitch in a month, he remains tied for first in the conference in saves with three. LOCK HAVEN – Senior first baseman Brittany Pataky of Clearfield was 5-for-9 and drove in three runs for Lock Haven in two double-headers last week to boost her batting average to .394, tied for 10th in the Pennsylvania State Athletic Conference. She singled three times and had two RBIs as the Lady Eagles completed a sweep of visiting Clarion with an 11-1 win in five innings at Lawrence Field Thursday. They won the opener 1-0. On Friday at Indiana, Pataky had one of Lock Haven’s three hits in a five-inning 8-0 loss and tripled across the first run in a 5-4 win. She leads the Lady Eagles in hits (37), RBIs (25) and on-base percentage (44.9) as well as batting average and is second in slugging average (.532). Her 10 sacrifice bunts are tops in the PSAC. Pataky has been charged with only one error in 305 chances for a .997 fielding average. Lock Haven (24-10) won 7-3 at Mansfield Monday to finish 10-5 in the PSAC’s Central Division, good for third place and a berth in the PSAC Tournament that begins Thursday at California. By virtue of a coin flip because all games were not played, the Lady Eagles will be the division’s No. 2 seed behind Bloomsburg. Indiana, which was 10-4, will be the No. 3 seed. WILLIAMSPORT – Sophomore Holly Lansberry of Curwensville was tagged with two losses, one a 2-1 decision, for Lycoming in the first games of twinbills with Scranton and Lebanon Valley last week. She pitched a five-hitter against Scranton, striking out six and walking one in a non-conference game decided by an unearned run at the Montoursville High School Field Thursday. The following day at James Short Park, Lansberry again went the distance in a 6-2 Commonwealth Conference loss to Lebanon Valley. She fanned six and gave up nine hits, one walk and five earned runs. The Lady Warriors dropped all four games for a 9-9 record. They are tied for third place in the conference at 3-3. Lansberry played in the outfield and had two hits, one a double, in the Scranton nightcap and was the designated player and singled once in the finale with Lebanon Valley. For the season, she has 18 hits for a .367 batting average that is fourth on the team and ranks No. 24 in the conference. In 11 appearances in the circle, including 10 starts, she has worked 67 innings with a 6-4 record and a 2.24 earned run average. Lansberry has given up 64 hits, 37 runs (25 earned) and 24 walks. She has racked up 58 strikeouts. NEW WILMINGTON – Senior Michael Johnson of Clearfield turned in his best performances of the season in two events Saturday to help Penn State Behrend win the 11-team Westminster Invitational at Harold Burry Stadium. Johnson won the high jump by clearing 1.85 meters (6 feet, 3/4 inch) to match his career-best effort and tied teammate Cody Bupp for first place in the 400-meter hurdles by crossing the finish line in 58.23 seconds. 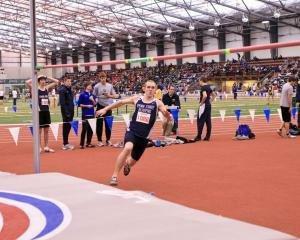 He also ran the first split for the ‘B’ 4×400 relay team that placed eighth in 3:38.57. Johnson accounted for 19.25 of Penn State-Behrend’s 171.5 points. Senior John Bowman of Clearfield earned four points by placing seventh in both the discus with a throw of 35.57 meters (116-8½) and the javelin with a throw of 42.12 meters (138-2¼). WASHINGTON – Senior driver Allison White of Clearfield scored one goal and assisted on another as Grove City defeated Penn State Behrend in the Washington & Jefferson Invitation in the Henry Memorial Center Saturday. The Wolverines, who were ranked No. 9 in last week’s Collegiate Water Polo Association Division III Poll, also trounced Notre Dame (Ohio) 16-3 to finish the regular season 14-12. White has 14 goals and seven assists this season.